Work with our new designer-in-residence Matteo Menapace in this special hands-on workshop for primary and secondary teachers. Recharge your creative batteries and join us for a glass of wine in this special hands-on workshop for teachers. Work with video games designer-in-residence Matteo Menapace to explore themes and ideas from our new exhibition Video Games: Design/Play/Disrupt. Open to Primary and Secondary teachers. Please provide your school email address when booking. 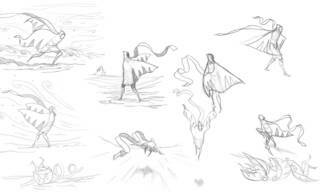 Background image: Character sketches, Journey ™ © 2012, 2014 Sony Interactive Entertainment LLC. Journey is a trademark of Sony Interactive Entertainment LLC. Developed by Thatgamecompany.